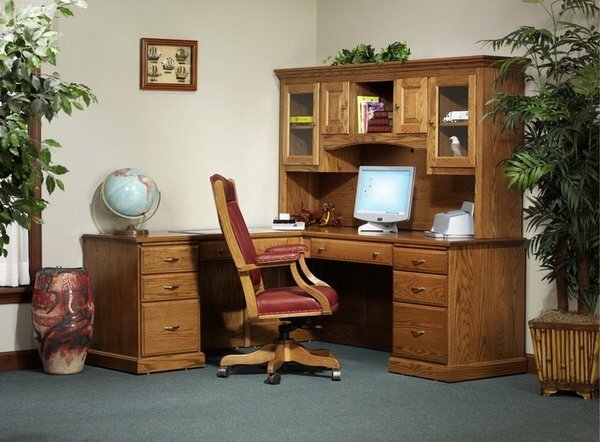 Our Amish handcrafted Highland L Desk will give you plenty of work space. The stylish lines of our solid wood L desk are sure to impress! This corner desk is available in a wide variety of wood and finish options. Choose to have this handcrafted in your choice of Oak Wood, Cherry Wood, Quarter Sawn White Oak Wood, Rustic Quarter Sawn White Oak Wood, Hickory Wood, Brown Maple Wood, Rustic Character Cherry Wood, Rustic Character Hickory Wood or Walnut Wood. After an order is placed we send out finish samples to assist you with making this selection. If you order online expect to receive the finish you selected in the mail with a few others in that same color range. Please call to speak to our Amish furniture specialists with questions or ordering assistance. We are happy to help.